The spacious lawn of the Spiritual Growth Centre can be hired for organising largely attended Jagran and Mata Ki Chowki in the backdrop of Trikuta Hills. In the evenings, the lawn presents a panoramic view of the well lit track to the Holy Cave Shrine. The lawn having a capacity for 1200 persons is also a best location for organising spiritual discourses, particularly in the evening hours. 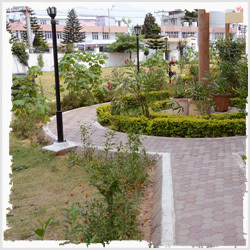 Catering arrangements for large groups of devotees and participants of other events organized at the Spiritual Growth Centre are also arranged in the Open Lawn.